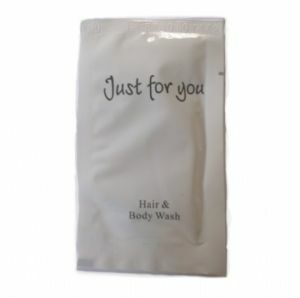 Guest Sized 10ml Sachets of the Just For You range hotel shampoo and Bath and Shower gel combined. 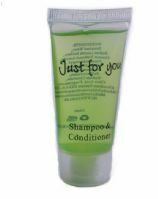 These ultra convenient and easy to use sachets of hair and body wash come with just 10 ml of liquid. Perfect for a single wash and great in high use areas. These sachets are the most cost effective way to offer your guests away from home bathroom toiletries. Each sachet contains enough hair and body wash for a single use. The sachets are finished in neutral white with dark green lettering.